Work continues fervently at Red Rider Stadium's Serpentini Field today as the crews were blessed with another great weather day. As you'll see from the pictures below, more than 50% of the existing sod has been removed and if the weather holds, all of the sod will be removed by week's end. I love sharing these pictures with my readers, but several times already I've had to stop and remind myself that THIS IS HAPPENNING...in ORRVILLE!! 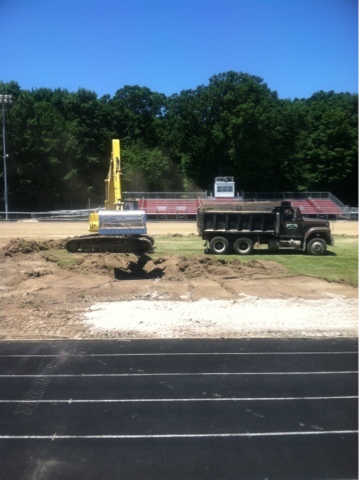 We WILL play Triway on September 7, 2012 on a turf field. Is that amazing or what? It's a testament to our community and the support of Red Rider alums all over the country. Life takes us all in many directions, but we're all still Red Riders. I don't have an exact number, but I think that among schools our size in the entire state of Ohio, there's less than 10 that can boast a turf field. The fact that we're going to be able to do this with 100% of the funds being privately donated speaks volumes about this special community. On to the pictures... (but don't forget to head over to RedRiderTurf.com to pledge your support today). 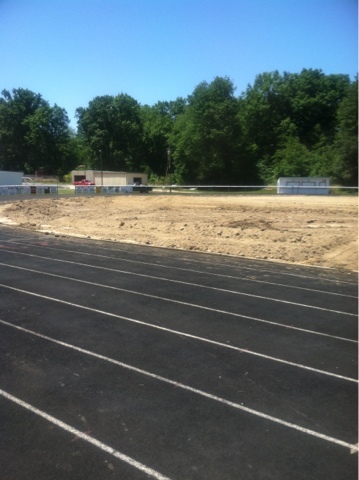 The first two pictures show the removal of the old goal posts. I'm told these posts were made by former Red Rider videographer Ron Coppa as he was a welder during his time in the Navy. These posts were installed in the summer of 1995 back when Dan Stultz was kicking field goals for the Riders on his way to Ohio State. 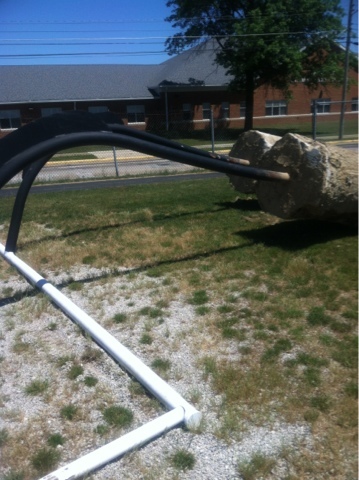 Not sure on the useability of these posts now that they've been ripped out of the ground. Would be nice to see them used at the middle school field, but since most games will be played at the new turf field (and the fact that field goals aren't a specialty of middle school teams), they might not be needed. 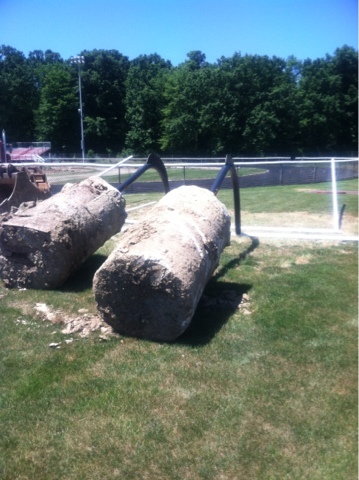 The new goal posts at the turf field will be ones that double as goal posts and as soccer goals. Here's a shot of the progress on the south end of the stadium where all of the existing grass has already been stripped away. 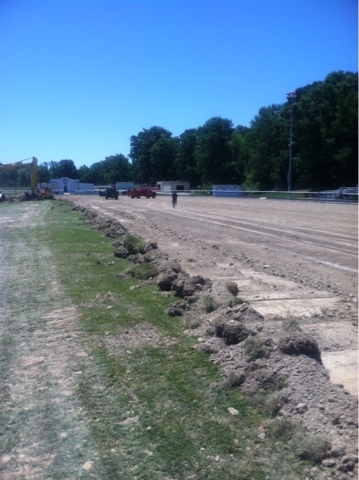 And here's a shot of the west side of the field, again, it's pretty much stripped of all the existing sod. Here's where progress was at around noon today. That's just in front of the home sideline, so around the 40-yard line in football speak. The trackhoe loads up the truck and off he goes. Not sure where they're dumping this, but I think it's north of town somewhere...maybe at the landfill on 57 north of 585. Lastly, this picture gives an idea of just how far down the crew had to dig to get rid of that crown that has built up at midfield over the years. 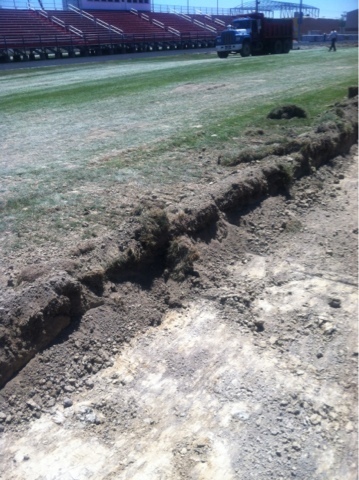 If I had to guess, I'd say it was at least 18" of dig between the existing sod and the subgrade. Amazing to think that from sideline to midfield, players were actually running uphill, and from midfield to sideline, running downhill. And here's your panorama of the day. It's only been 2 days since the first one of these I did, but you can already see a big difference.